This week I’m sharing another recipe from Argentina, marinated eggplants or “berenjenas en escabeche”. 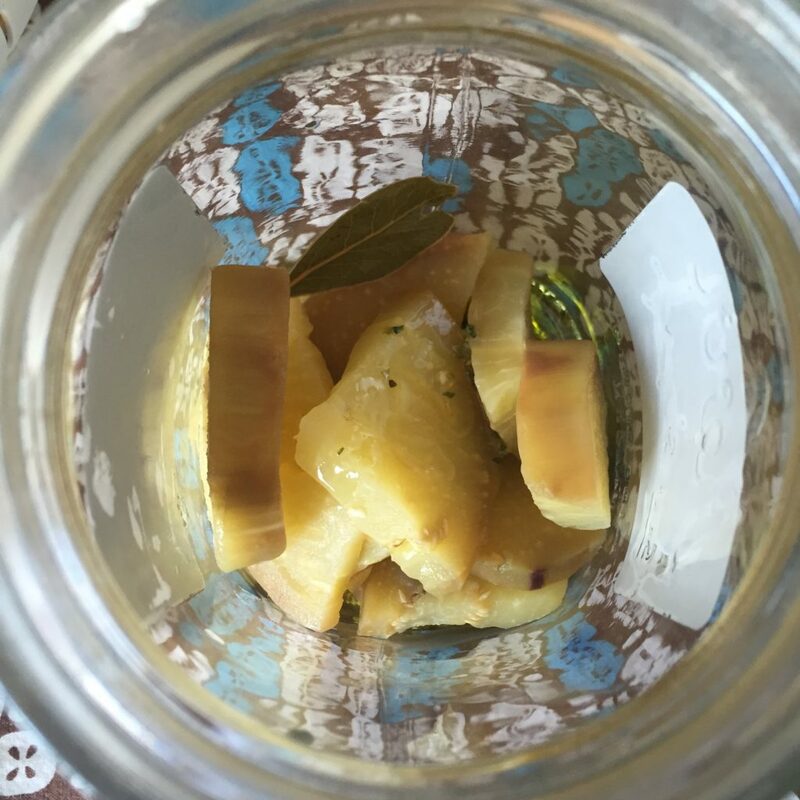 I’ve learnt to appreciate this kind of “pickles” while I was living in Buenos Aires. While I was working at Turner (CNN, Cartoon Network, etc.) 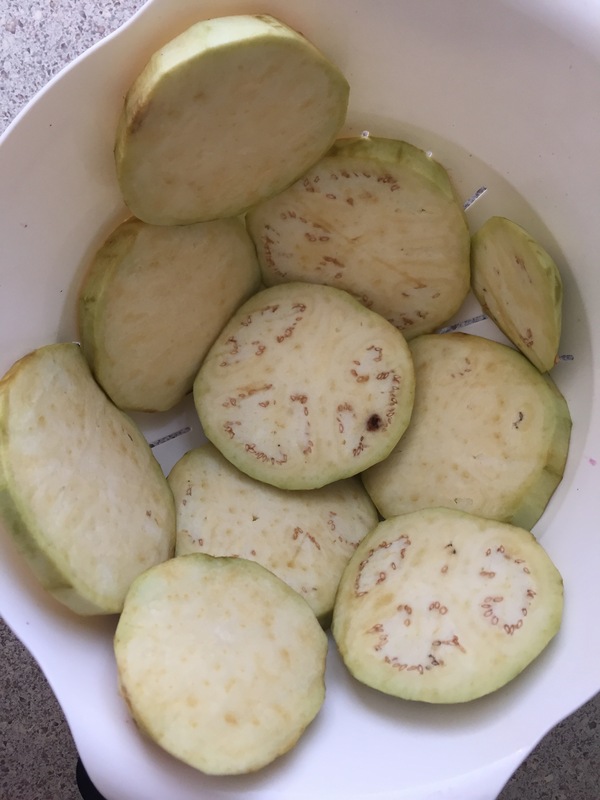 I used to go to a little food shop on my lunch break where a very grumpy old lady sold the most delicious sandwiches with cheese, chicken milanesa (kind of a fried breadcrumbed chicken) and these marinated eggplants. 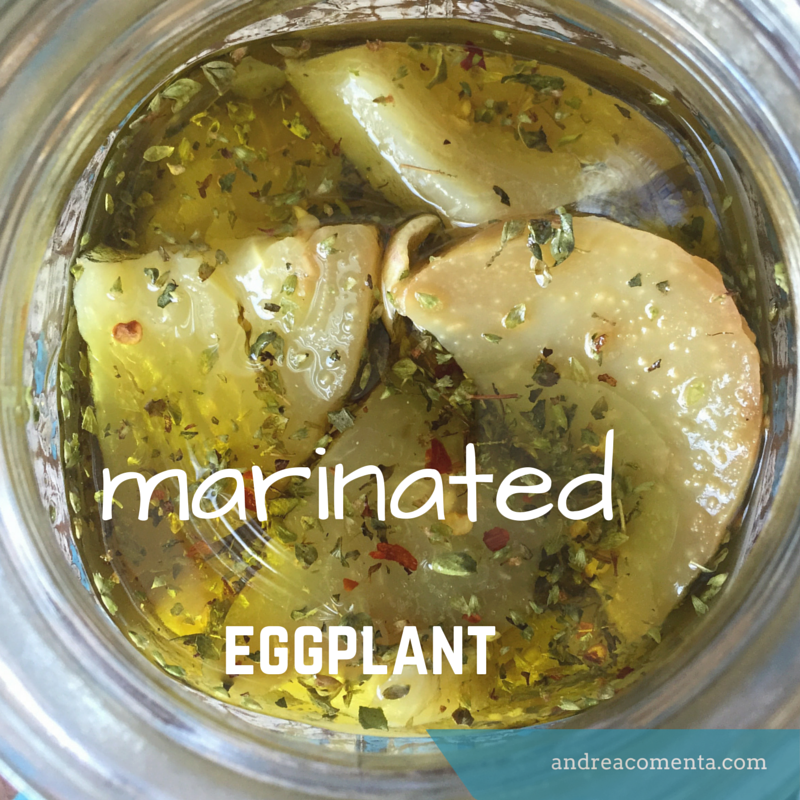 So, here’s my recipe for the marinated eggplants. Nowadays, I used them on a grilled cheese sandwich. 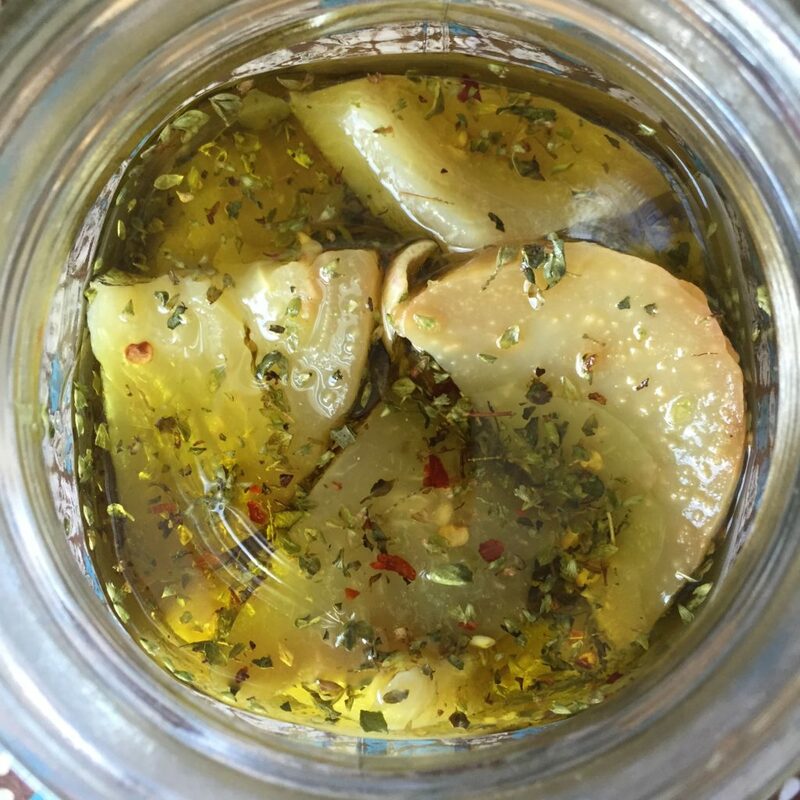 It gives it an extra special garlic-oily-spicy flavor that it’s amazing! 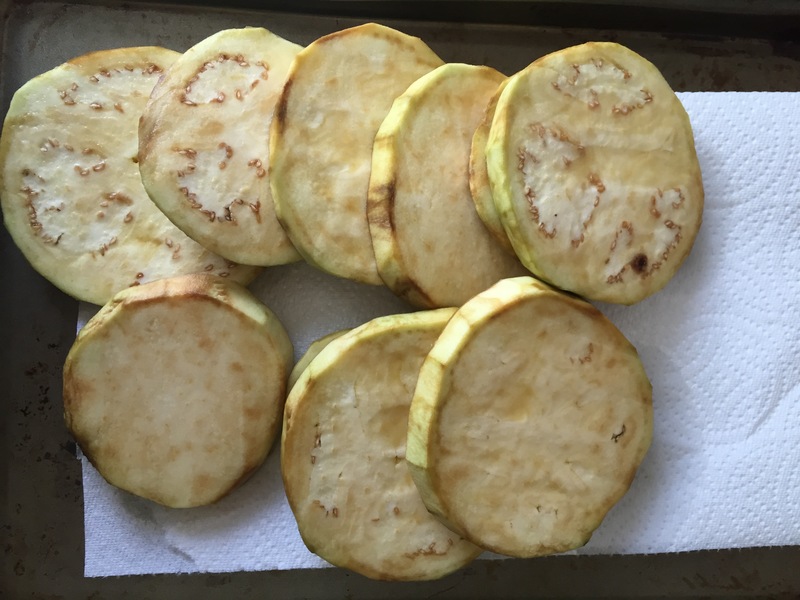 Peel and cut the eggplant in thick slices (about 0.4 inches each). Put the slices in a colander and sprinkle the teaspoon of salt over them. Let them rest at room temperature for about 30 minutes. Prepare the spices and the olive oil. 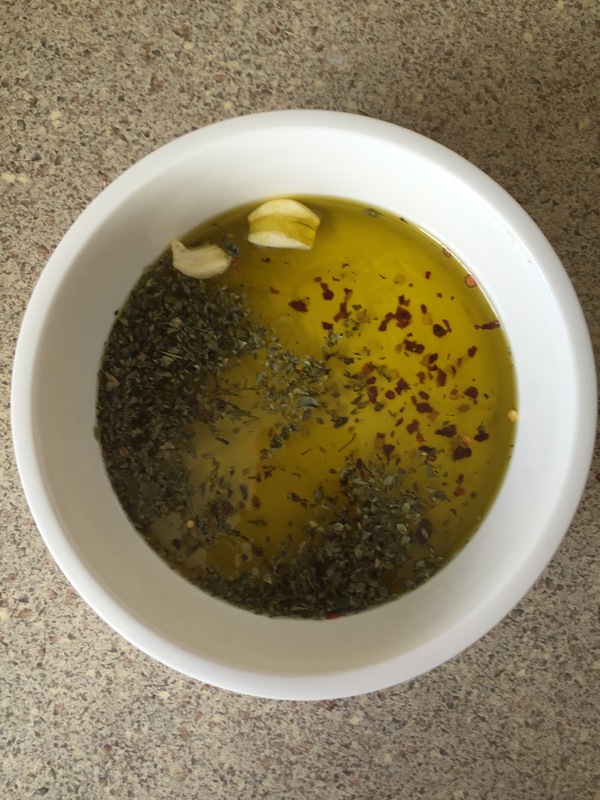 Mix the spices -oregano, garlic, red chili pepper- with the olive oil in a bowl and stir it with a spoon. 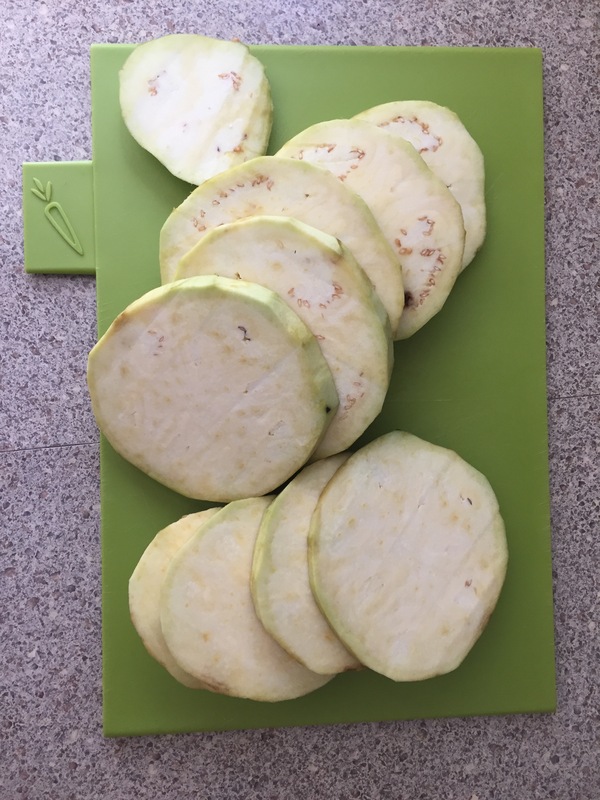 Remove the slices of eggplant from the colander, quickly run some cold water over them and pat dry with a paper towel. 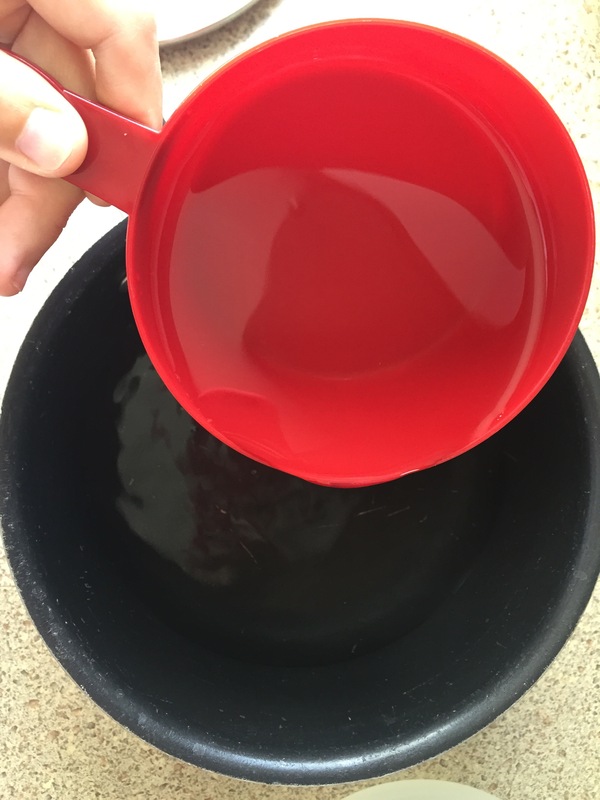 In a medium sauce pan, mix the vinegar with the water. 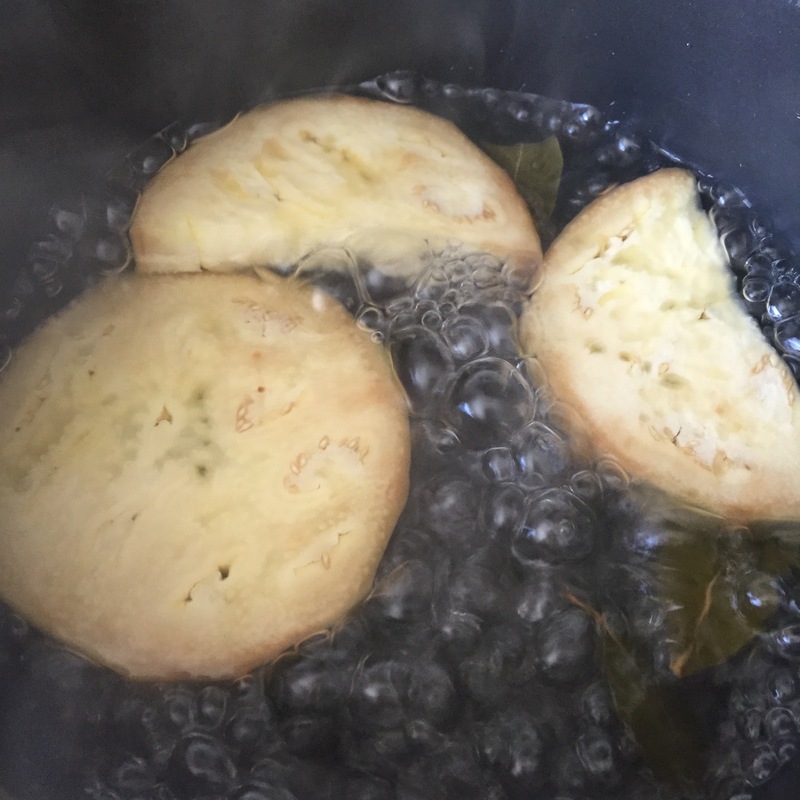 Bring the water already mixed with the vinegar to a boil and add the bay leaves. 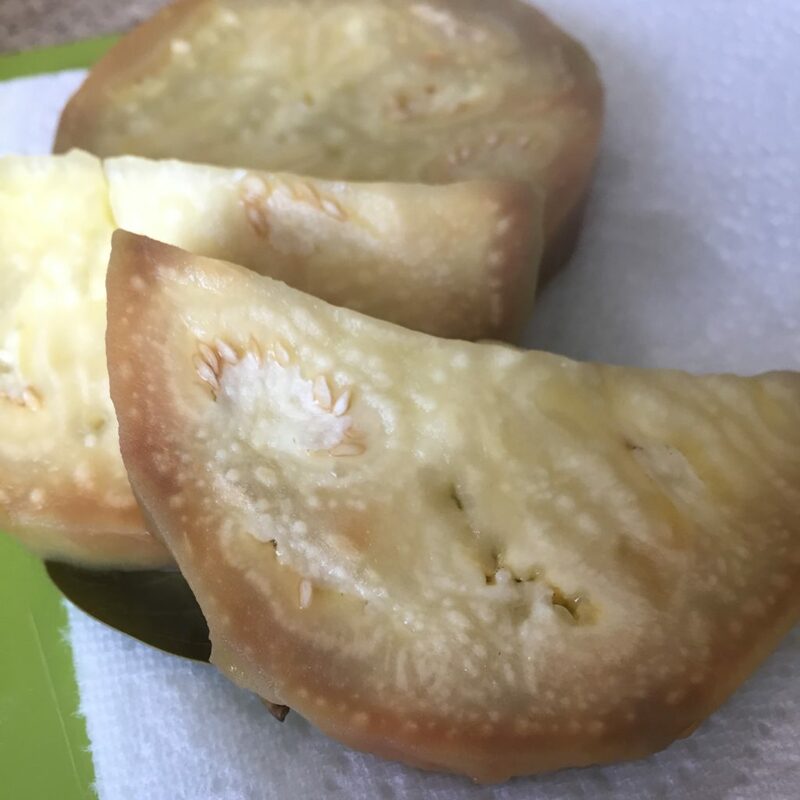 Cut slices of the eggplant and add them to the boiling water. Let it cook for about 5 minutes and remove the eggplants. 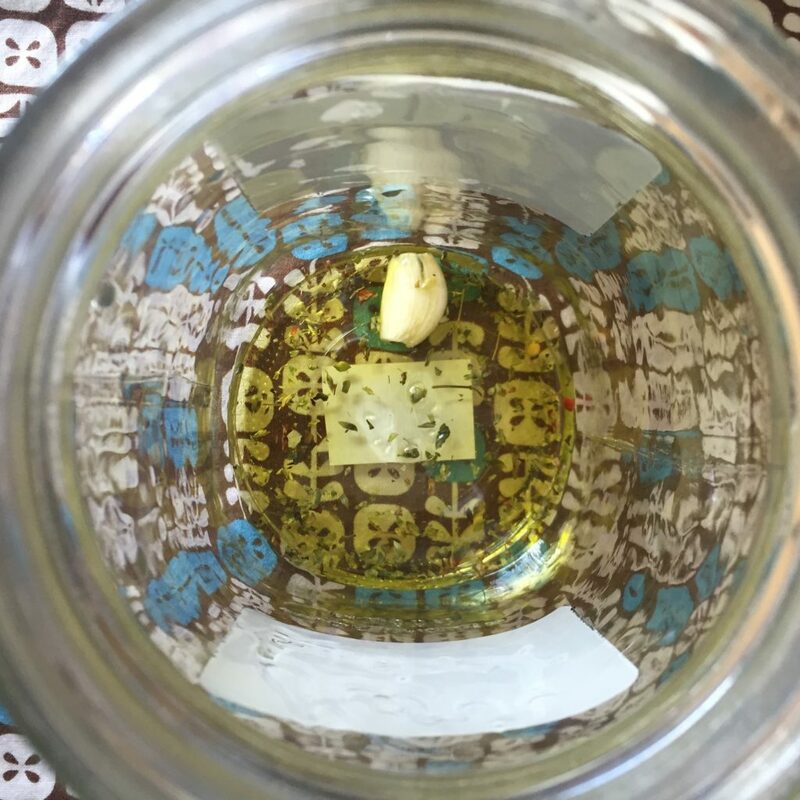 In a sterilized jar, add about 1/4 cup of the olive oil and spices mixture. Add part of the eggplants and some more of the olive oil mixture. Continue doing this until, layer by layer, until finished. Let it cool at room temperature and then save it on the fridge. You can eat them the day after if you want, but the more days go by, the more tasteful it will be! 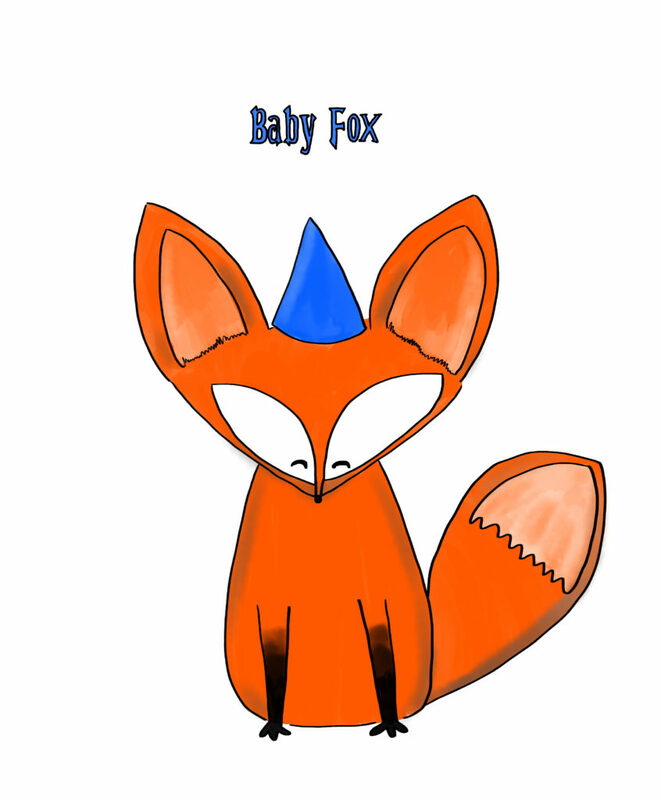 Today, I want to share some images of a little fox that I drew for a dear friend who is expecting a new baby. 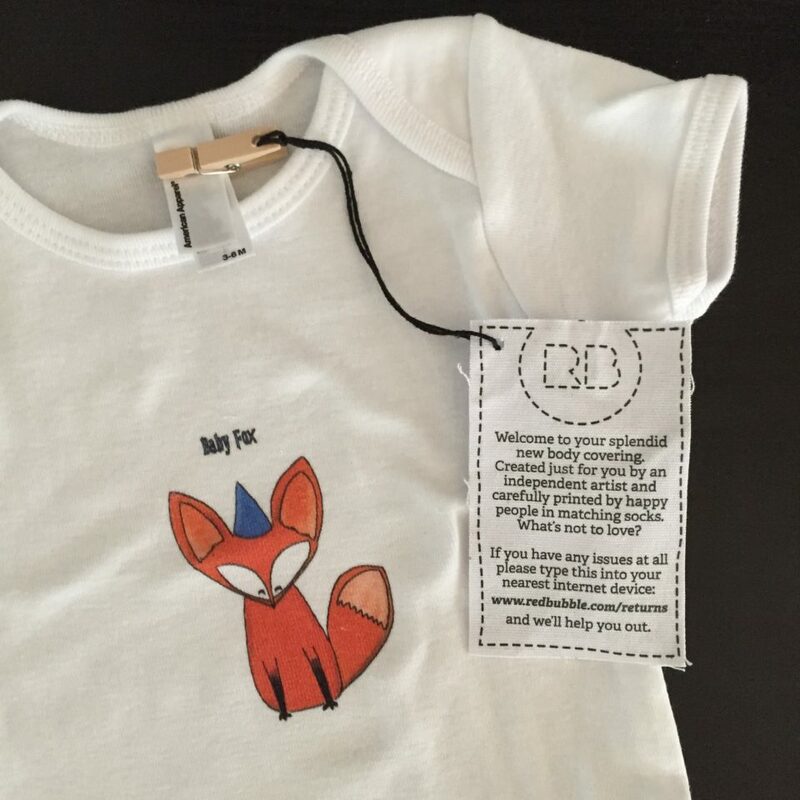 I used the illustration as an art-print but also on a onesie. 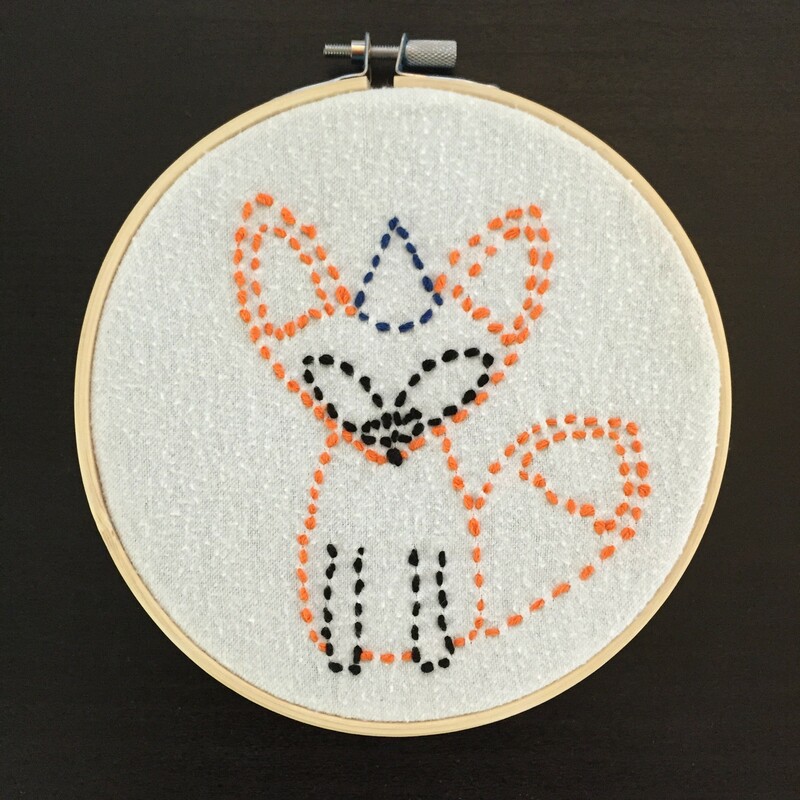 Since I also enjoy sewing and creating things with my hands, I chose to use the same baby fox illustration as an embroidery. 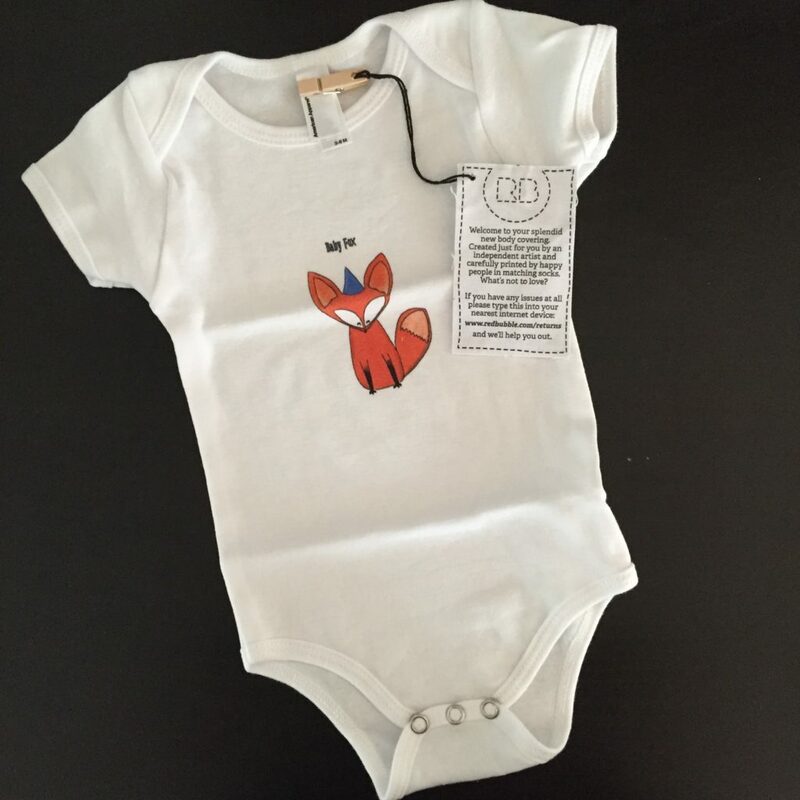 I drew this little fox thinking in this new baby that’s coming to a dear family of friends of mine and all that love made it an extra special and enjoyable project! 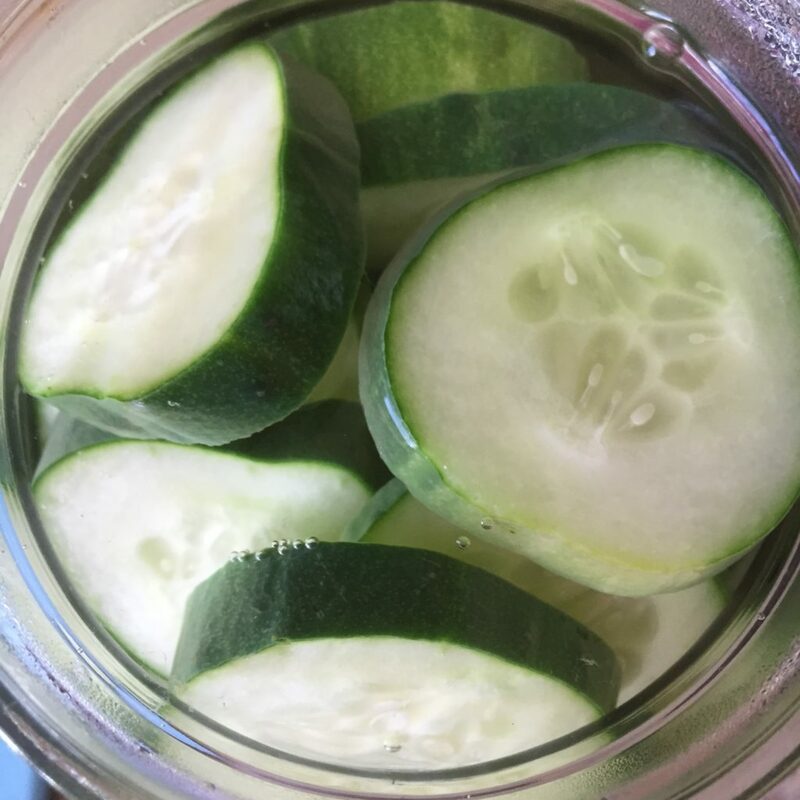 Summer is here, what means… pickling cucumbers are available at the farmers market! 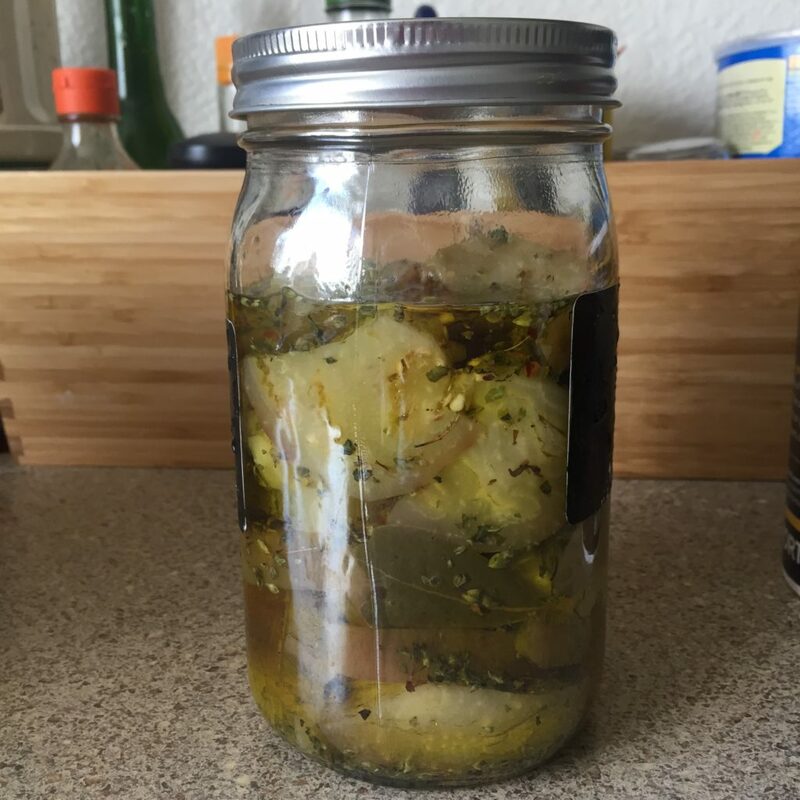 My mom, being of German heritage, used to almost always prepare this huge jars with pickles. 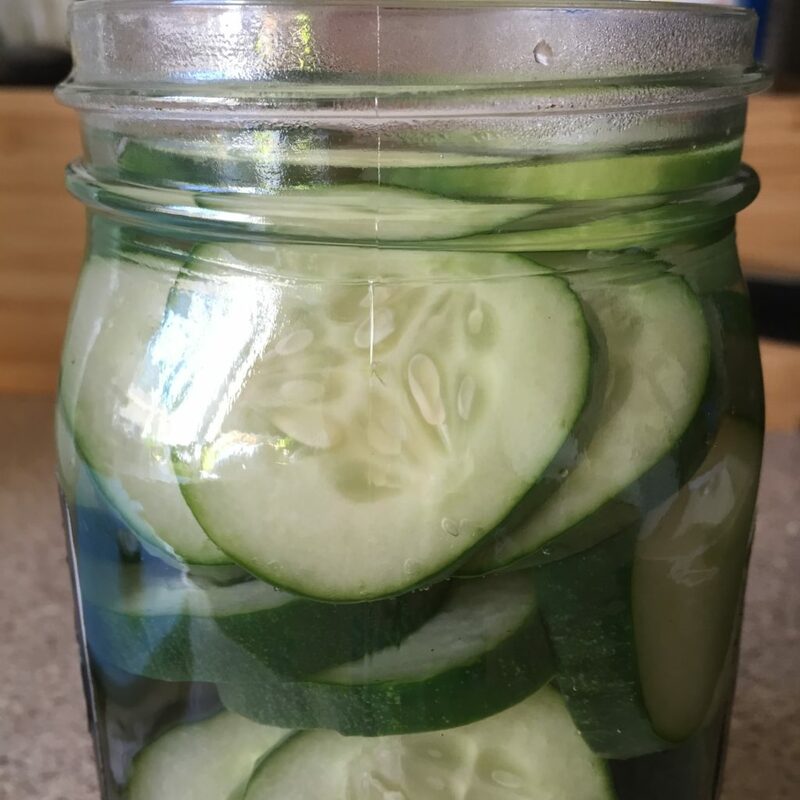 Not only cucumbers, she also used other vegetables, like onions and carrots, she even used to make pickled eggs (that one was not my favorite, but still, we had a lot of these pickles jars at home). 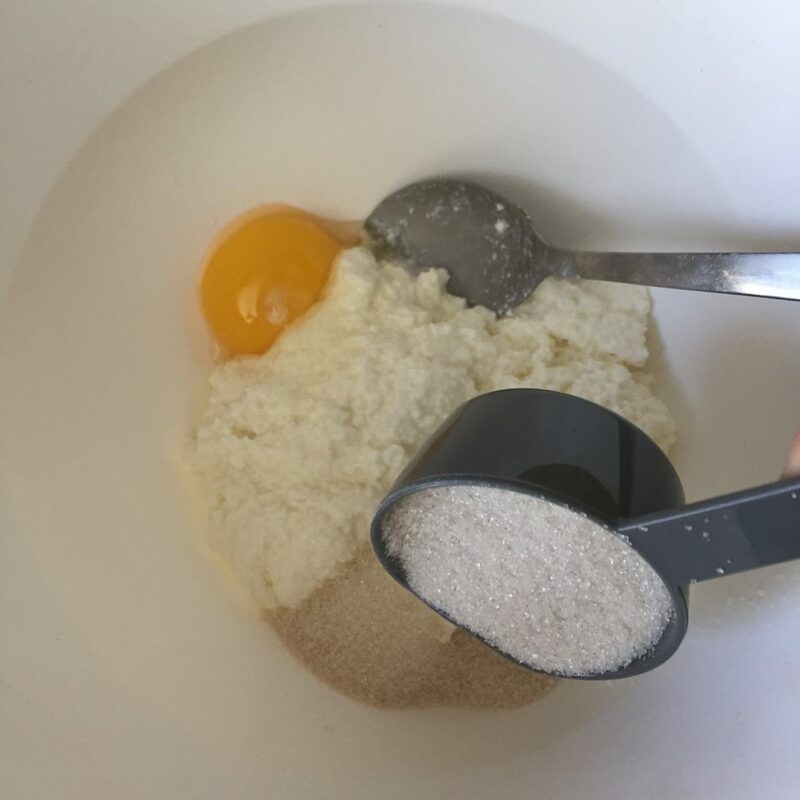 You’ll find a lot of different recipes calling for a lot of ingredients, specially seeds or spices that -unless you cook a lot with them- are not always at just any home. This is like… “the easiest version”. 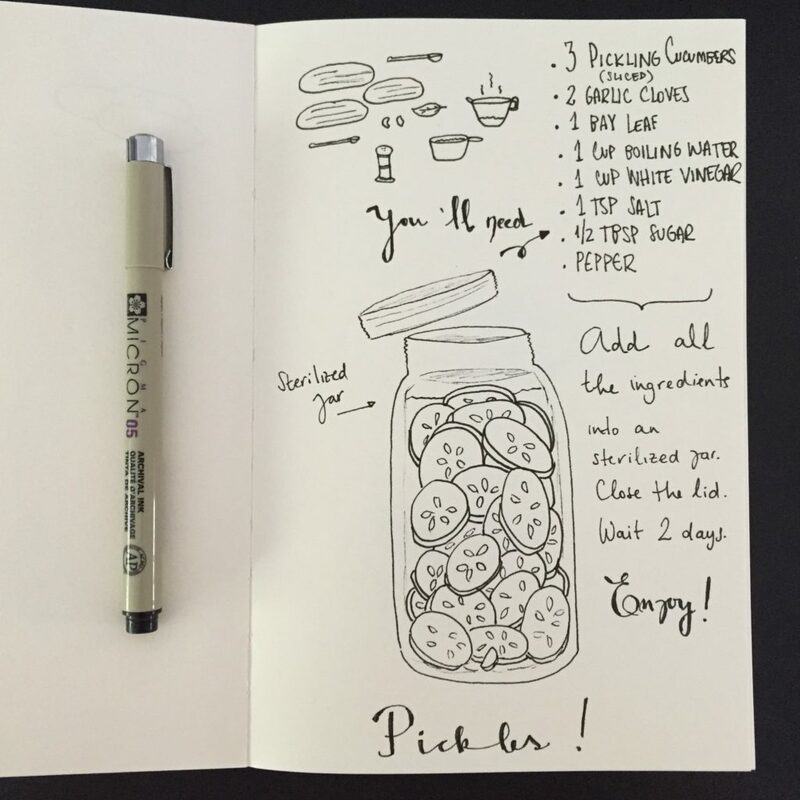 A quick illustration to make a summary of the recipe. 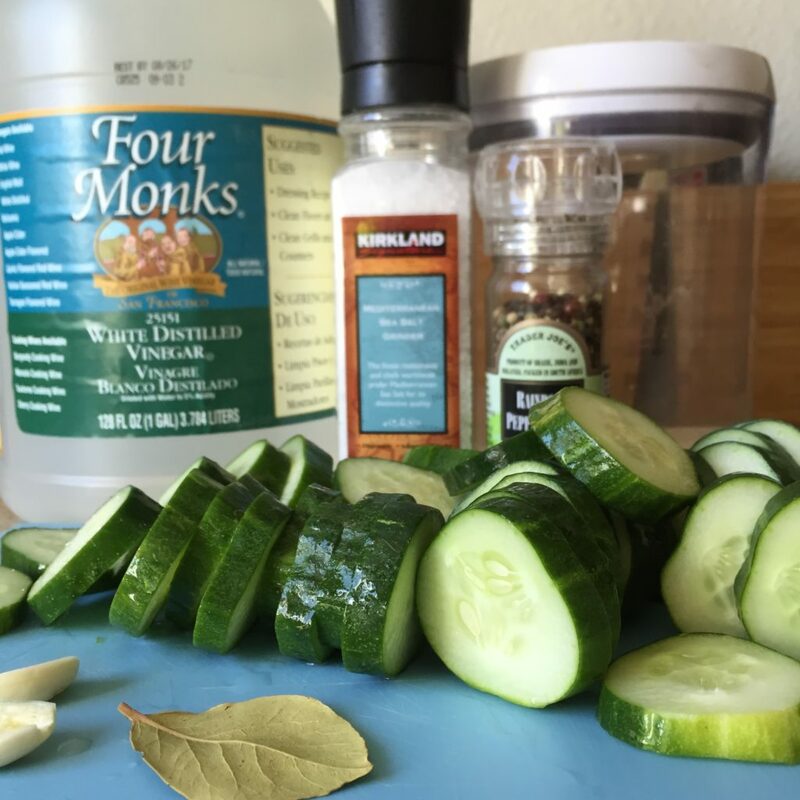 *Optional: If you have dill, add it to this recipe. 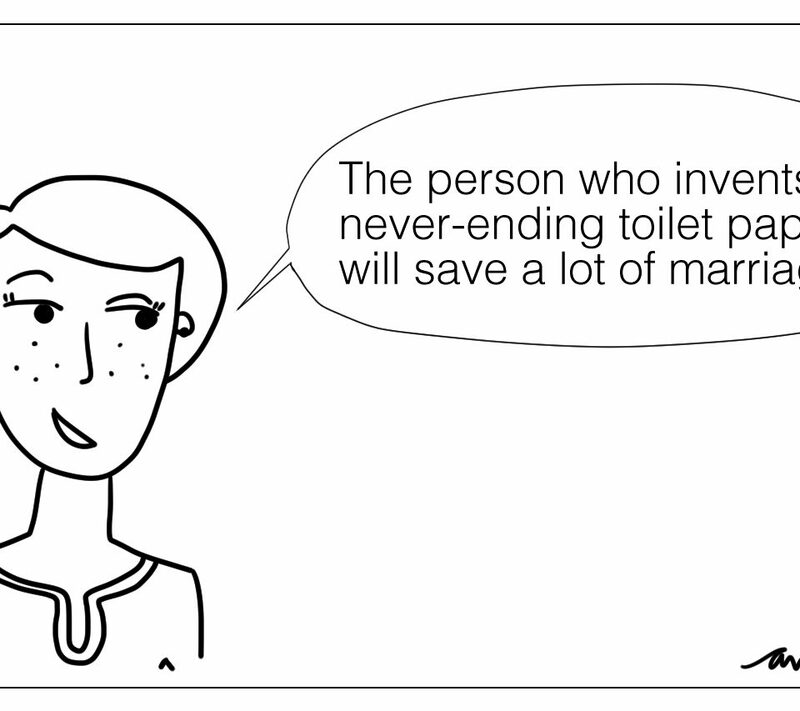 It gives that particular taste of cucumber pickles. 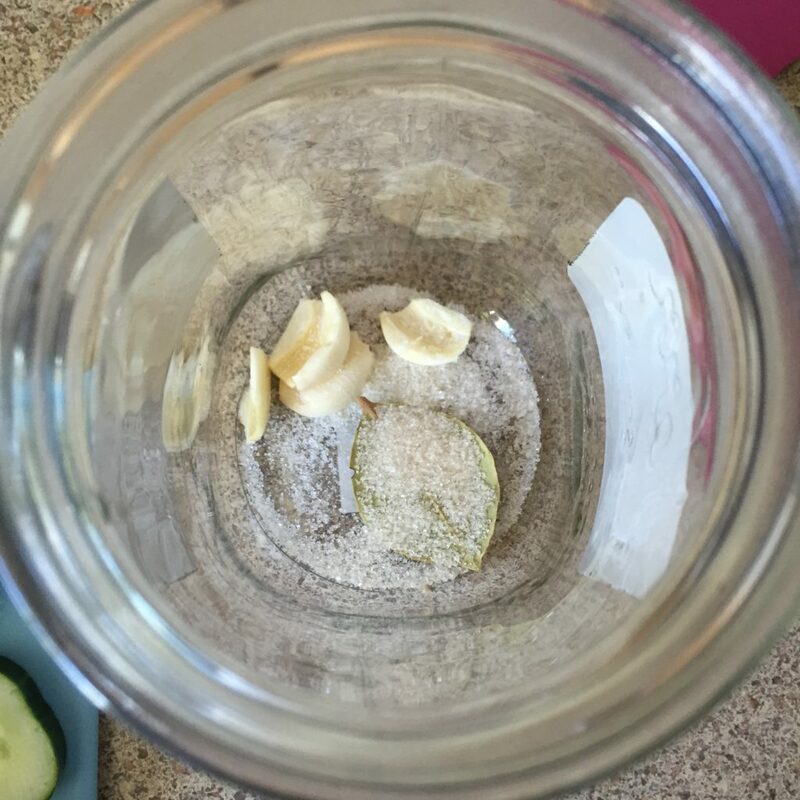 Add the sugar, salt, garlic cloves without the sprout, bay leaf and some grains of pepper into the sterilized jar. 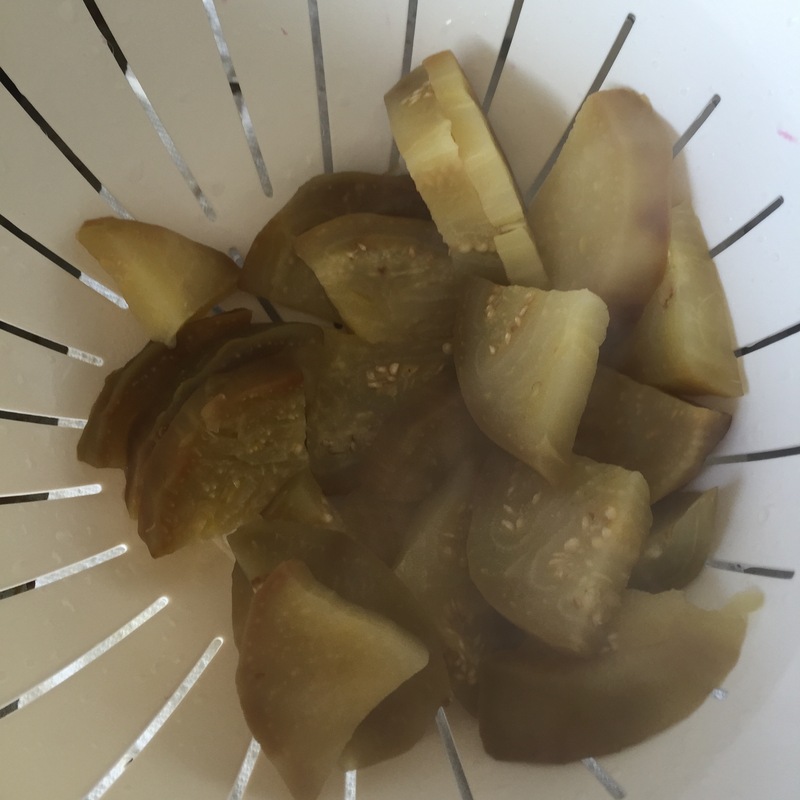 Add the sliced cucumbers and pour the cup of white vinegar and finally the cup of boiling water. Close the lid while the jar is still hot. Let it rest at room temperature for about 2 days. Once it’s opened, you can keep it in the fridge for about 2 months. 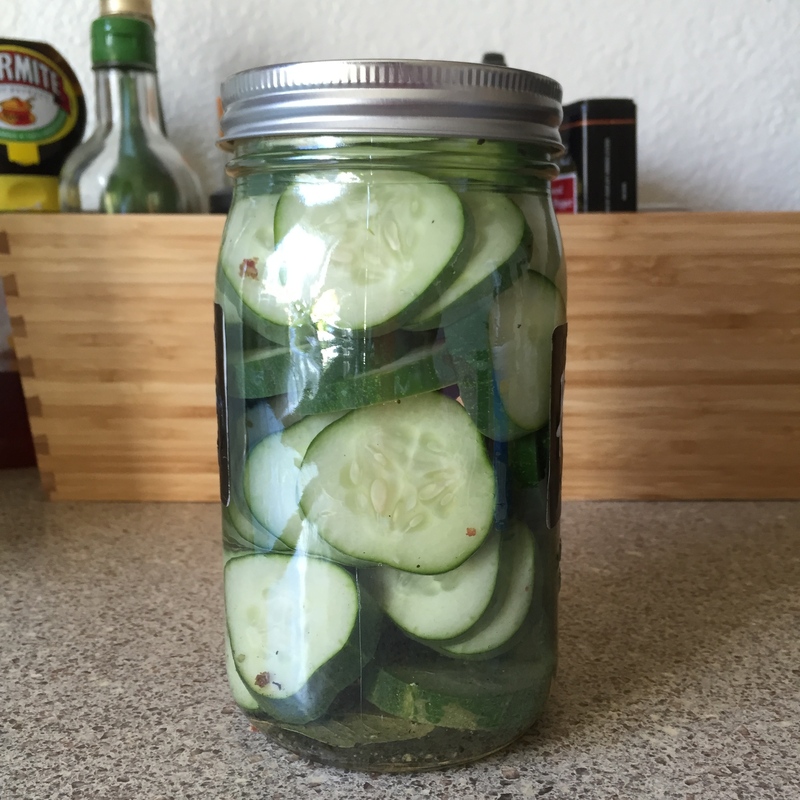 Add these delicious pickles to your burgers or tuna sandwiches. They are yum! 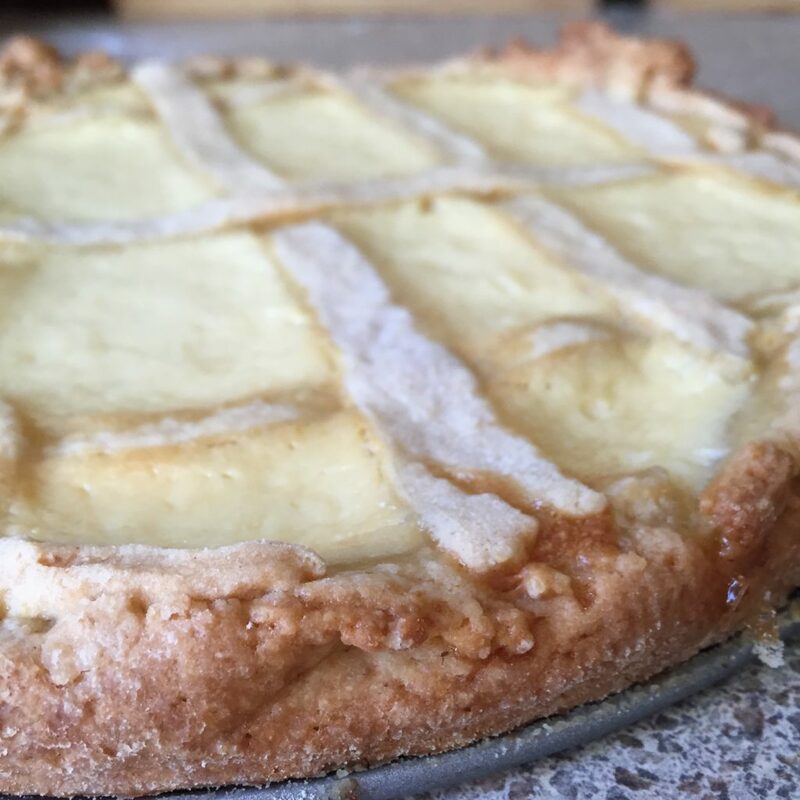 This week, I’m baking another of my favorites argentinian pies! 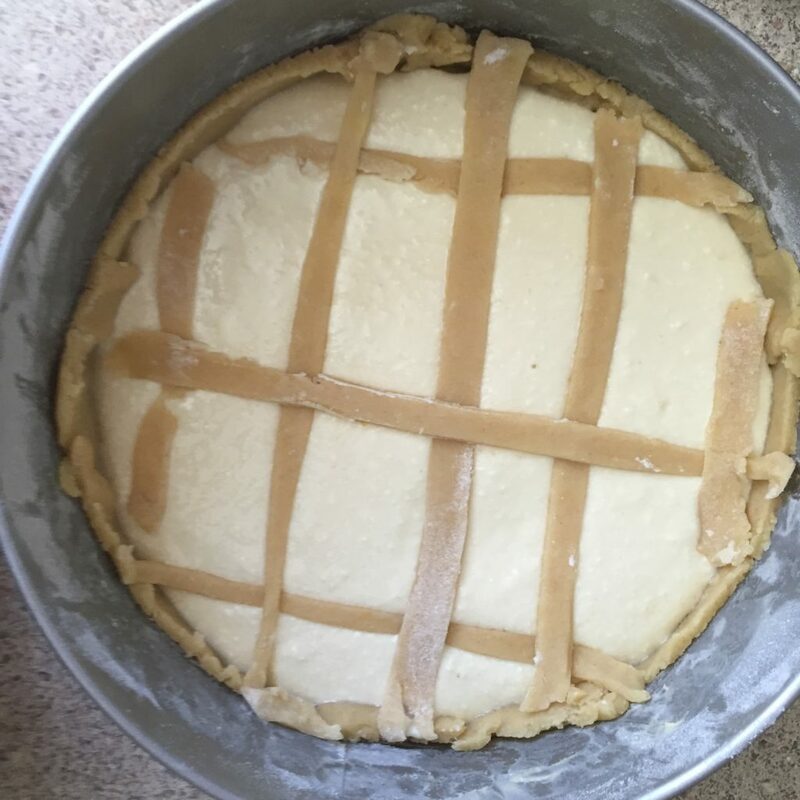 We’ll use the pastafrola pie crust but this time, we’ll filled it with ricotta cheese and honey. Delicious. 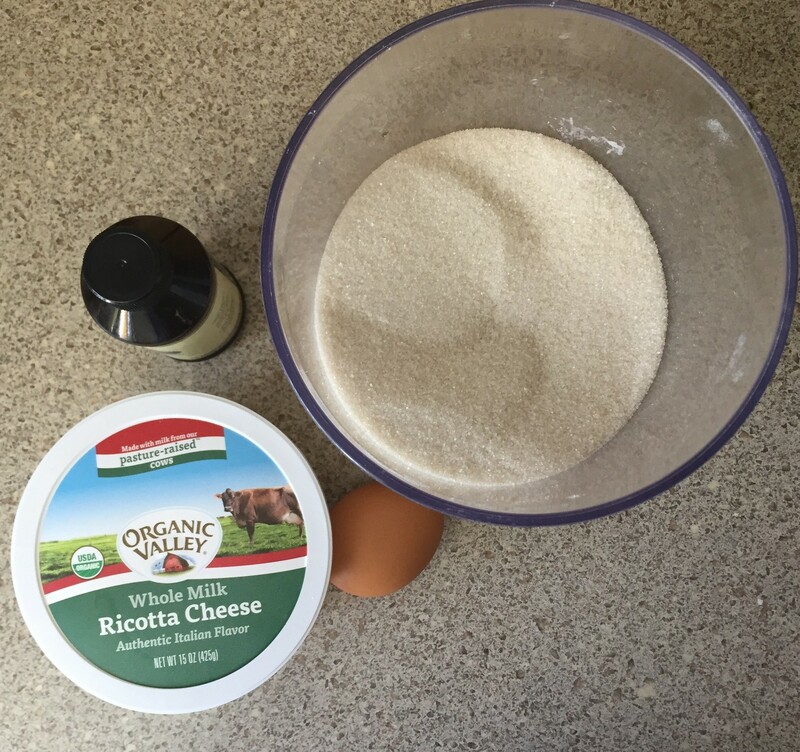 1 1/2 cups organic ricotta cheese (if you find the Organic Valley made from pasture-raised cows, better. The taste it’s pretty similar to argentinian ricotta cheese). 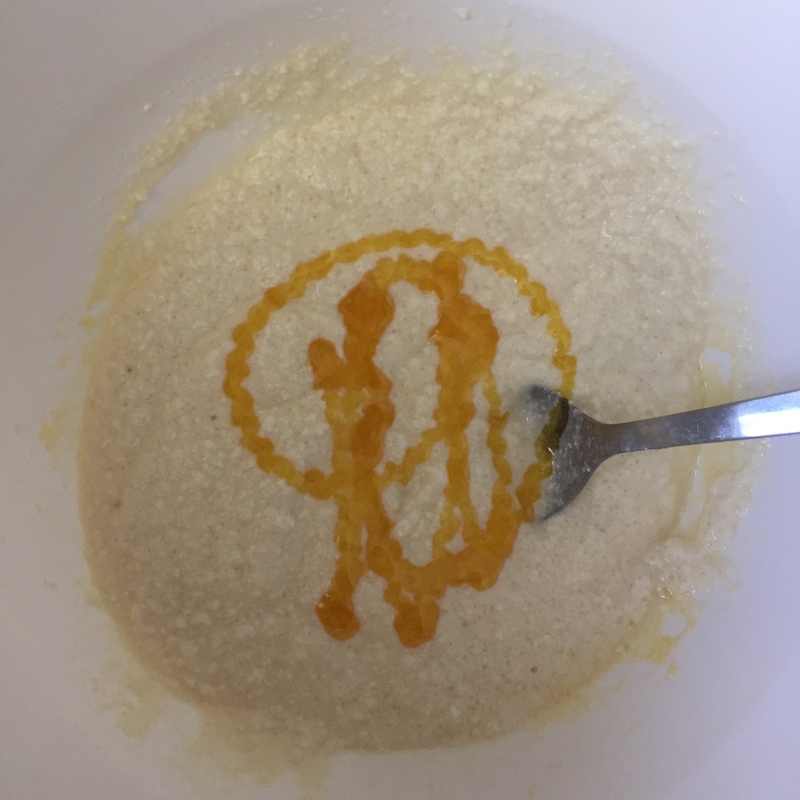 Put the yolk, the ricotta and the sugar into a medium bowl. 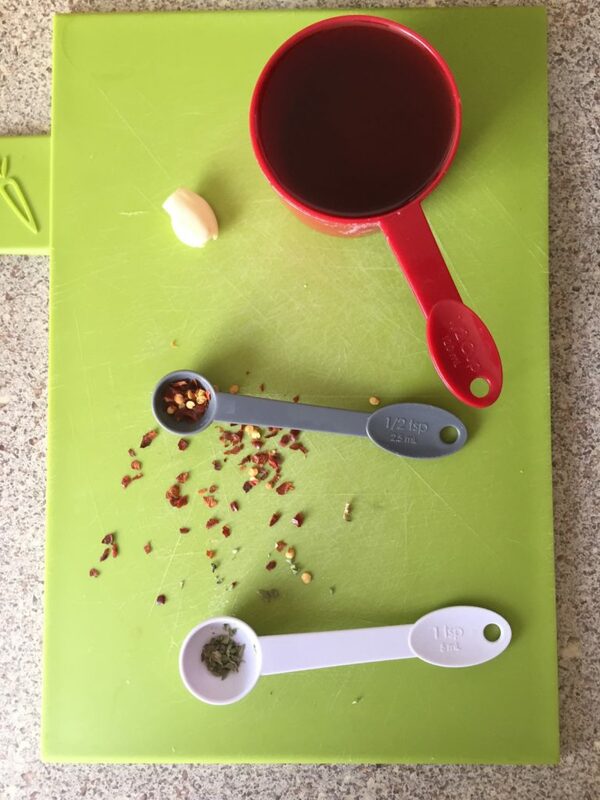 Stir all the ingredients. 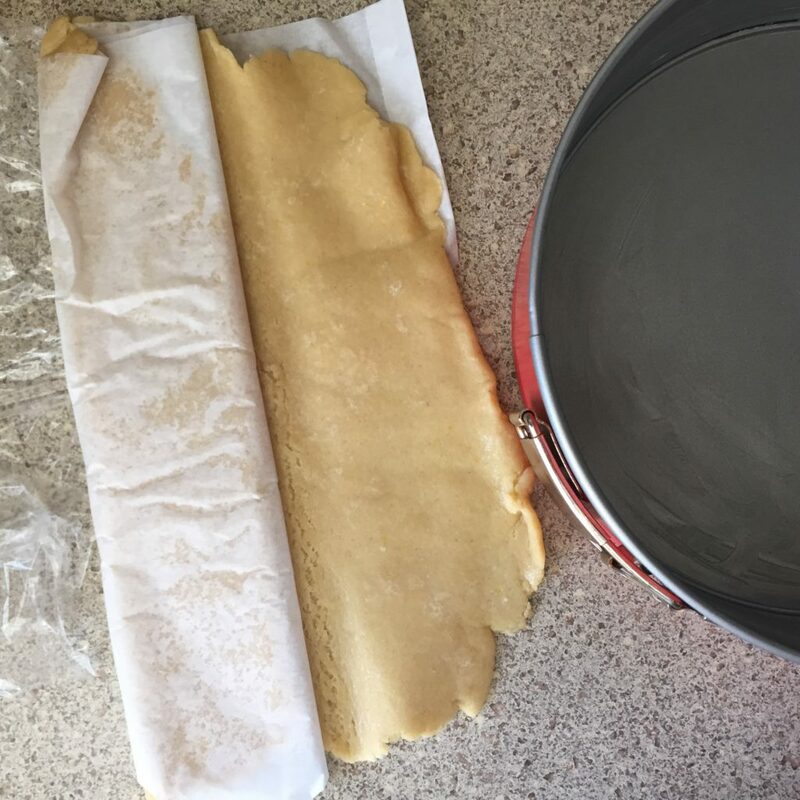 Grease and flour a pie or cake baking pan. 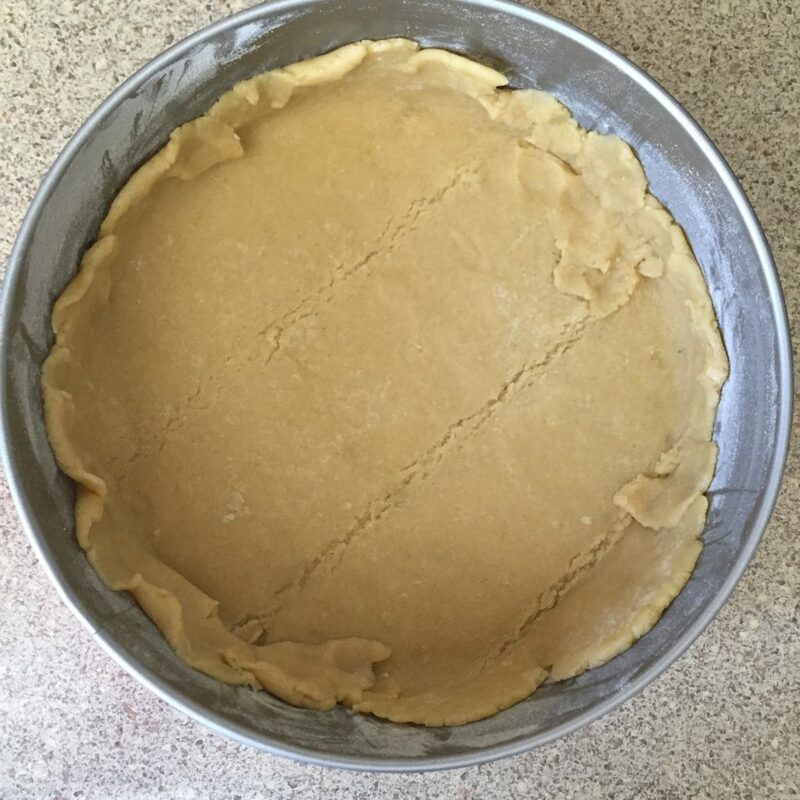 Put the pastafrola crust in the pie/cake pan; the pie dough must be at room temperature to use it. 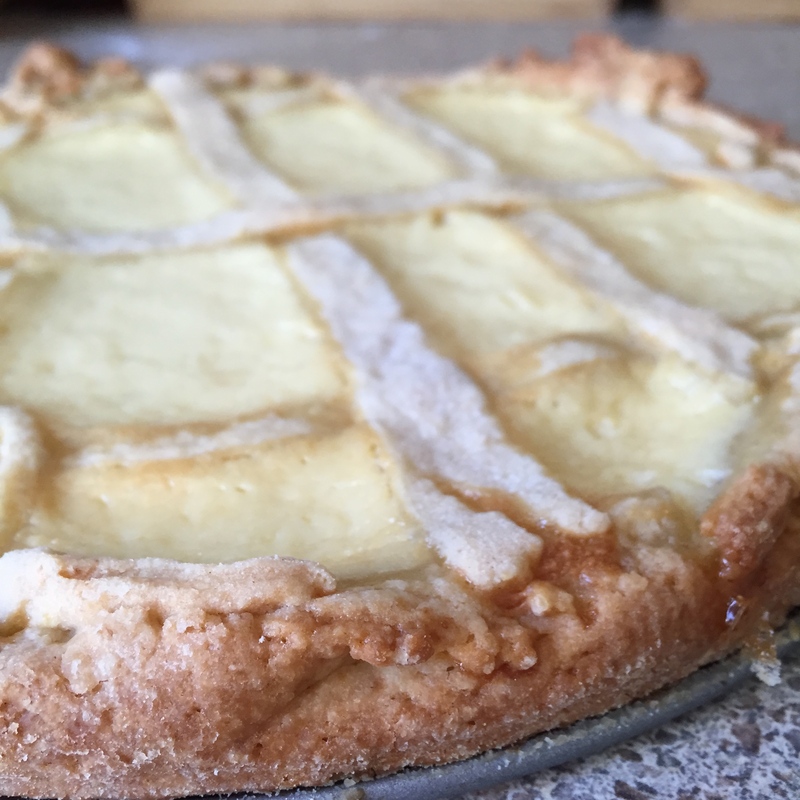 Use the leftovers of the dough to garnish the pie. 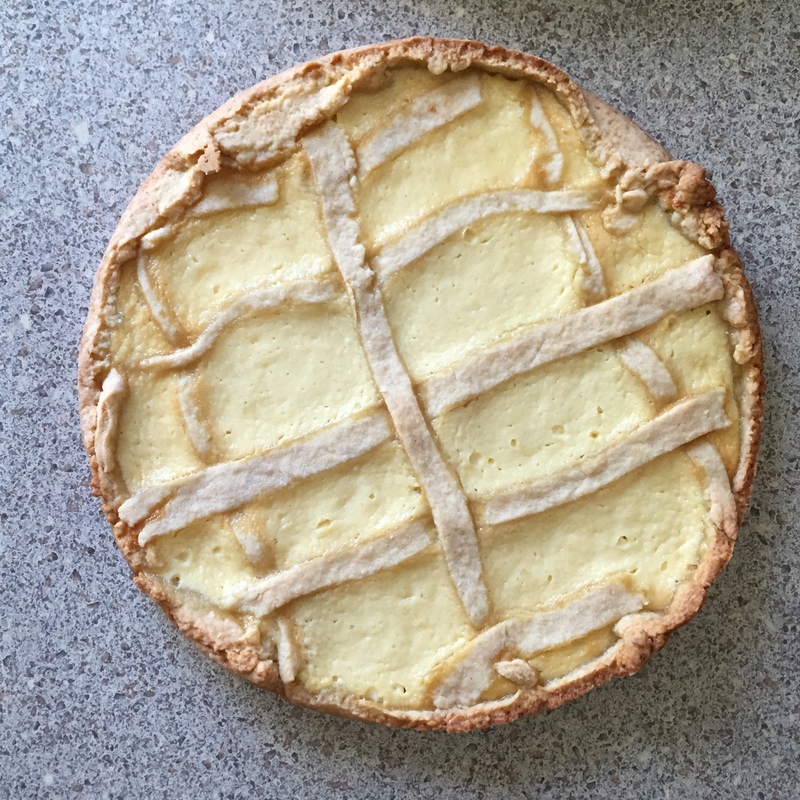 Bake the pie for 45 to 50 minutes at 350F. Let it rest at room temperature for about 30 minutes. Prepare some “cortado” (machiato) and imagine yourself in any Café Porteño (coffee shop from Buenos Aires).